Seriously, I cannot believe we’re halfway into the 12 Weeks of Christmas Cookies Blog hop! What I am especially loving is the fact that I’m filling my freezer with these yummy treats. A friend today just asked me if I was hosting my annual cookie exchange again. You bet. And I thought to myself I might actually be able to attend one of the other ones I’m usually invited to but stress out about making cookies the night before! 2) because of not doing #1, I had to push back dinner which was supposed to also bake in the oven for about 30 minutes—ooops! 3) And another because of not doing #1, do not put the kisses on BEFORE you bake…do it after like it says to do. Although they still turned out ok.
Just like the Chocolate Cat Face Cookies I told you about last week, this week my daughter pretty much took over and made these cookies herself. I was right there but she wanted to do most if it alone. I could get used to this baking-for-me trend. Although there are cherries in the dough, the flavor is subtle and I’d say these are more like a shortbread cookie. The chocolate kiss on top is just the right touch. A few years ago, Hershey’s would sell unwrapped kisses during the holidays. I’ve not been able to find them in about four years so I think they stopped making them. Boy, were they handy for cookies like these! With their festive color and the kiss, I sometimes make these cookies for Valentine’s Day too. I hope you like them! Beat butter, add sugar and salt. Beat in cherry liquid and almond extract. Beat in flour. Fold in cherries. Refrigerate dough for at least 30 minutes (you don’t have to, but dough is easier to work with when cold). Roll dough into balls, coat in sugar and place on cookie sheet. These cookies will flatten on their own, but I typically put a thumb print in the center to flatten some. Bake at 325 degrees for 14 minutes. Let cool on pan for 1-2 minutes. 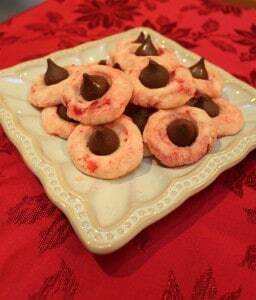 Add Hershey Kiss/Hug to center of the cookies. (Hugs melt especially fast, you may want to let the cookies cool a little longer before adding Hugs, but cookies should still be warm so chocolate can melt into the cookie). 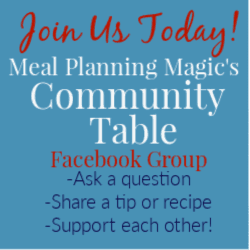 Are you a blogger that would like to join our blog hop? Then join us every Thursday (or any Thursday you can make it!) from now until December 15th. And if you’re not a blogger or just not up for blogging about it, then join us anyway and fill your freezer. Each week we’ll be bringing you lots of new inspiring recipes. Put on your baking cap and collect all those recipes from your recipe box, magazine cuttings, cookbooks or online. Now is the time to make those cookies you’ve always wanted to. And feel free to make a bar or even a candy—any sort of sweet treat will do! TO JOIN/LINK UP (READ THIS FIRST! ): Add your link using the linky tool below. Link-ups require approval so if you don’t see your link appear right away, that is why. 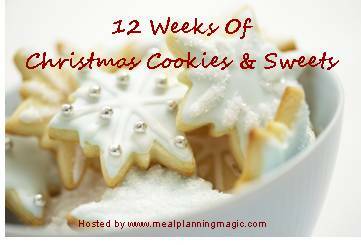 When adding a link it MUST be a post dated 2011 and your post must mention the 12 Weeks of Christmas Cookies blog hop. No links from previous years to any old random Christmas cookie recipe just to get extra traffic to your blog, sorry! If you want to join the blog hop for future weeks and add the thumbnails to your blog for future weeks, please email me and I will send you the code and .jpg image to use. Thanks so much! Be sure to visit all the other bloggers shown below to see what they’ve baked up today! « 30 Day Gourmet’s BIG Book of Freezer Cooking Giveaway! Yum! Love the cherry color (and flavor, too) swirling through these. They look wonderful! I love chocolate and cherries – what a perfect cookie combination! Mmm, those look and sound really good. Love chocolate/cherry combo. Your post this week made me laugh. I always skim over recipes and have found that I miss all kinds of stuff. For some reason I think I know what to do when I really don’t. BTW – You’re cookies look amazing! I love chocolate kiss cookies, and cherries are a nice addition. I have been there before with the reading of the recipe. I sometimes forget something altogether! These sound great. I have been thinking about making a cookie like this and using the cherry filled kisses that are available this time of year. Maybe I will use your recipe and give that a try. Great tip about reading a recipe all the way through. We get surprised sometimes if we don’t. Been there, done that. Thanks for sharing. Mmmm, cherry and chocolate. Delicious! I’ve got something similar to this on my must make list !